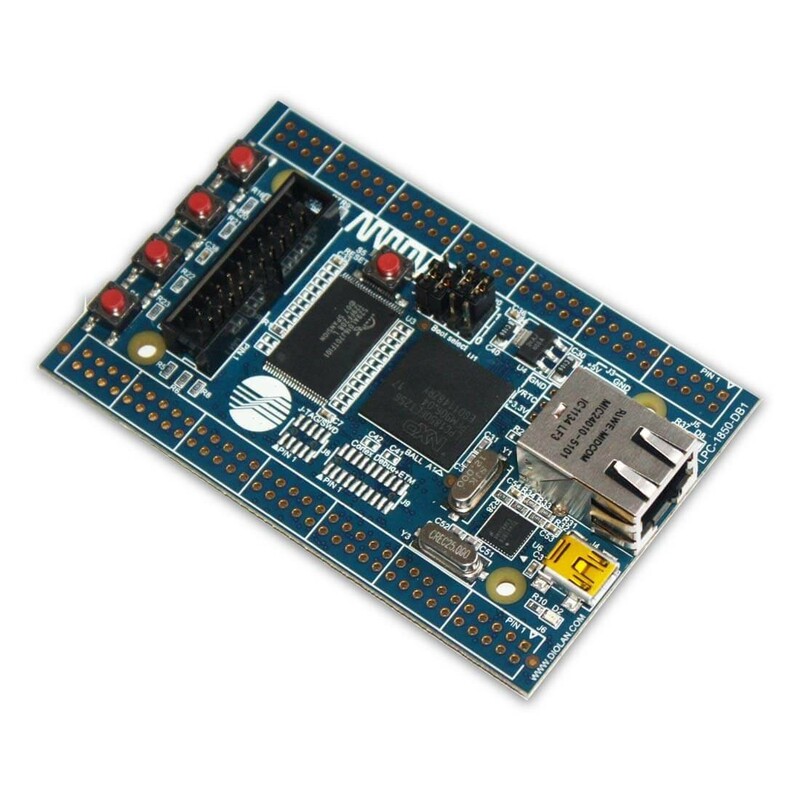 The LPC1850-DB1 evaluation board consists of the most essential components that you need to start your development. It contains the LPC1850 ARM Cortex-M3 microcontroller, USB, Ethernet and JTAG connectors, 4 push buttons + 4 LEDs, 16MBit external NOR flash. The LPC1850-DB1 evaluation board can be connected to a wide range of extension boards (TFT/Transmissive LCD Extension Board with Touch Screen, HDMI/DVI Extension Board, SDIO/SD Card + I2C/SPI Memories Extension Board and RS232, RS485, CAN Bus and Full Speed USB Extension Board). The LPC1850-DB1 development board contains most of the extensively used components. Its peripheral support can be easily extended by the LPC1850-DB1 PCB soldering options and wide range of extension boards. LPC1850 - 150 MHz, 32-bit ARM Cortex-M3. 10/100MBit Ethernet interface - LPC1850-DB1 evaluation board contains assembled external PHY and connector. Cortex Debug + ETM Connector - this small 20-pin 1.27mm (0.05 inch) connector can be assembled to access SWD, SWV, JTAG, and ETM (4-bit) signals available on Cortex-M3 processors. The Directive on the restriction of the use of certain hazardous substances in electrical and electronic equipment 2002/95/EC (commonly referred to as the Restriction of Hazardous Substances Directive or RoHS) was adopted in February 2003 by the European Union. This directive restricts the use of six hazardous materials in the manufacture of various types of electronic and electrical equipment. LPC-1850-DB1 Development Board adapter is RoHS compliant.